Can Labels Be The Solution for Walmart Cases? Much has been made recently about Walmart's case labeling requirements and how it will effect their supply chain. Walmart is the dominant retailer with long supply chain roots throughout the world. It takes extreme organizational skills to move massive amounts of products from manufacturer to the store shelves. Any weak link in that system can lead to confusion and financial losses. So when Walmart wants to upgrade the efficiency and accuracy of the shipping cases they receive at their stores, thousands of companies must take notice. Apparently most companies use ink jet coding to print variable information on their cartons. Walmart requires Interleaved 2 of 5 GTIN14 bar codes on every case shipped to their vast array of distribution centers and stores. But when these boxes are stacked in the store stockrooms, it can be hard for employees to find what they need in a timely manner due to the current labeling. Walmart is trying to solve this issue by requiring suppliers to have the GTIN14 bar code on all four sides of the carton so that, no matter how the boxes are stacked, a readable bar code is presented. But here is where we start scratching our heads. According to what we have read from a few sources, including Pat Reynolds' Packaging World article, some of Walmart’s new rules are going to cause a few headaches with dry grocery and food item manufacturers (excluding fresh meat, fish, poultry, and produce). As we mentioned, each master case must have a GTIN14 bar code on each of the four main sides of the carton and on the top. Each case must also include the brand name and sub-brand name, best with the brand logo. This information also needs to be on all four sides plus the top of the case. Visuals like logos help store employees recognize the brand and find what they need faster. Initial case quantity must be on all four sides of the carton along with a blank square where employees can update the quantity of the case with a marker as it is emptied. A vendor stock number must appear on at least one side. Walmart wants indication of the type of case printed on the top: Single Stock, Shelf Ready/PDQ or Case Cut Capable. There must be a statement of temperature requirements on the top for refrigerated or frozen products. And the case must have a Lot Number and Best-By Date on all fours sides for refrigerated products, and on at least one side for other products. Date format is to be MM/DD/YYYY. For shrink-wrapped trays, Walmart wants the GTIN14 printed on each of the four sides of the tray and will allow the rest of the required information to be printed on the tray or on a pressure-sensitive label that is applied to the film wrapping. These new Walmart requirements will provide important information that should be readily available to store associates whose job it is to organize, inventory and restock their stores. We all agree that Walmart needs this information on each case to maintain or improve their store efficiencies. But we are not sure that preprinting cartons will make sense in the long run. Isn’t that what companies used to do 20 years ago and we moved away from it? Flexographic printing of required information on cartons and cases would increase costs for manufacturers. Instead of being able to use the same carton for a wide range of products and imprinting the variable information, a company would have to have a pre-printed carton for each product. Let’s say you are a manufacturer of flavored drinks.You would like to use one generic carton for everything and just imprint the variable info via ink jet or labels. If you have 5 different flavors, you would now need cases for each flavor. That’s five times the cost of using generic cartons, five times the warehouse space for the empty cartons, and, when you no longer produce one of the flavors, those obsolete cartons end up in a landfill. This seems inefficient, wasteful and not very environmentally sound. We believe there are more options for efficient case labeling. Contrary to what Walmart believes, high-resolution ink jet coding can produce bar codes that are ANSI/GS1 compliant. When used correctly, they can produce legible bar codes, logos and other variable data that would meet the requirements of the new Walmart mandate. Perhaps the reason Walmart wants to move away from high resolution ink jet coding is that many times production lines will not get the maintenance or oversight needed to keep these ink jet systems working in top form. Often the marking can be less than perfect if the manufacturer does not maintain their production line. But simple bar code scanners could reject non-compliant coding before it gets shipped, allowing only compliant labeling to be delivered to Walmart. Using pressure-sensitive labels is an even more reliable way to ensure that the correct information is added to every case. Variable information can be printed onto a variety of label sizes and applied to each of the sides of a carton. All of the Walmart required data can be printed on either blank white or custom printed label media that contains a company’s logo and other non-variable information. Label printer-applicators are available that can either apply labels to two adjacent sides or apply one long label that wraps around the corner of two adjacent sides. Two of these systems would be required per line, but the ROI on this investment vs. flexographically printing cartons would be fast. Changes to product descriptions and bar codes could be made quickly. Walmart already has a mandate in place for frozen baked goods that requires the variable information be printed on a white corner-wrap label that is applied to two opposite corners of a carton. This allows the information to be seen on all four sides clearly with excellent bar code scannability. Weber Packaging Solutions has two reliable, field-proven systems that can help you get you cases labeled on all four sides: The Model 5300 Twin-Tamp and the Model 5300 Corner-Wrap. Both of these systems could make it easy for a company to comply with 4-sided carton labeling requirements. Walmart should allow for case labeling, a proven solution, to ease the burden and still solve the problem they’re encountering. If you would like to see examples of these systems in action, visit our 5300 Series Label Printer-Applicator pages. 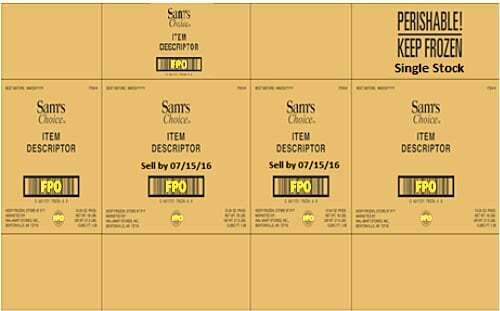 If you have questions about Walmart case labeling, talk to one of our labeling experts.